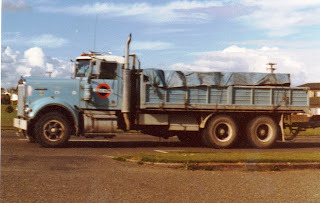 This is getting very close to the end of my old truck photos, but there are just a few more yet. 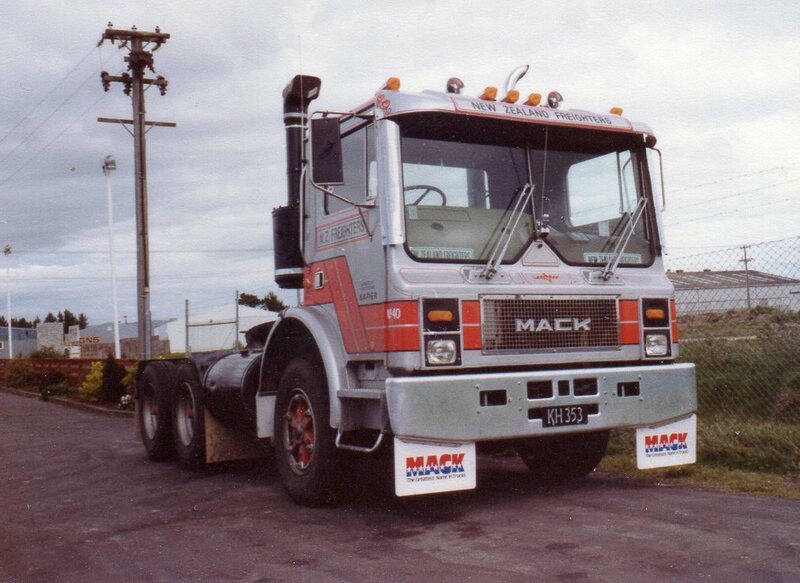 M series Mack of New Zealand Freighters at MTD yard in Palmerston North. This was one of the first photos I took with my, then, new SLR. 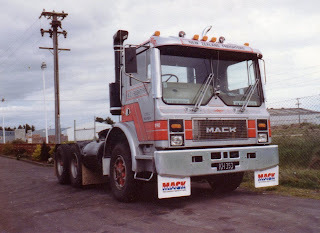 I remember my photographer friend telling me off for not getting the power pole out of the picture. 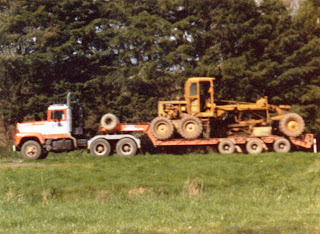 This Mitsubishi is coupled to the first trailer of a B-train. 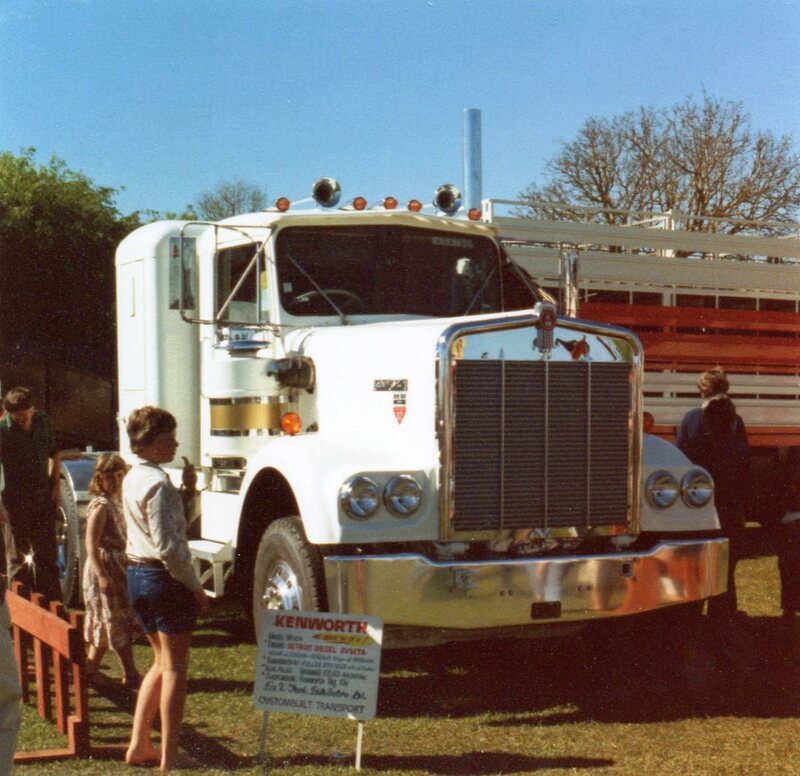 The rear bogiecan be slid backwards and has a fifth wheel for the second trailer. When the bogie is slid forward, as in this picture, the fifth wheel fits neatly between the chassis rails. This type of B-train seems to have gone out of favour now and fixed trailer bogies are more common. 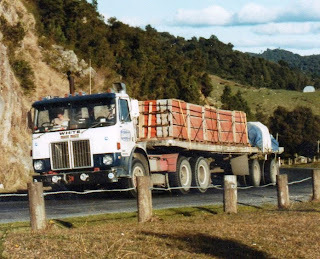 White Road Expeditor of Direct Transport, at the top of the Kaimais, with a load of what looks like roofing tiles. Early White Road Boss with grader load somewhere in the central North Island. 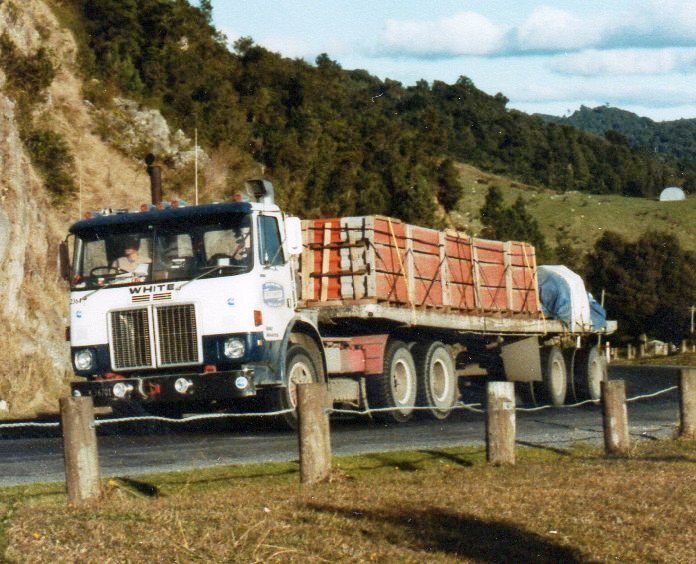 "Barney Boy" parked in a rest area in the Hawkes Bay. 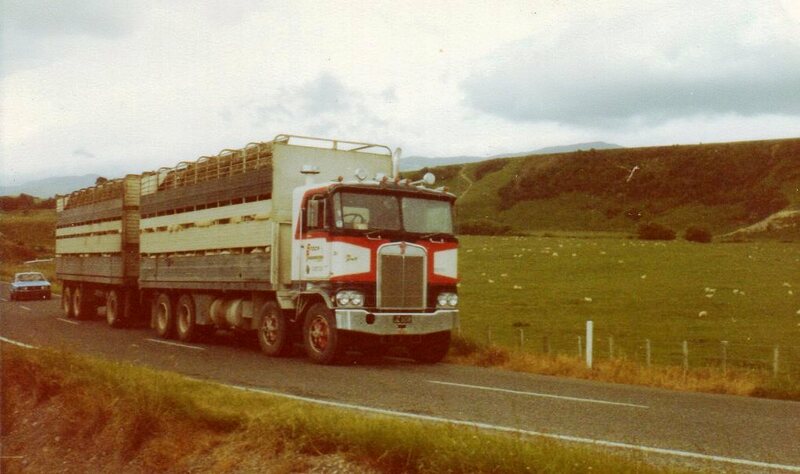 Stock Transports K model Kenworth in fairly typical NZ stock truck set up. 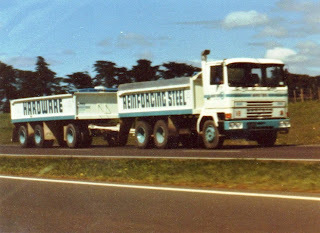 Wide cab Bedford TM on the Auckland Southern Motorway. W900 in Trailways livery passing through Taupo. 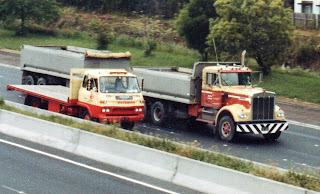 Another W900 bulk tipper passing a TK Bedford on the Auckland Motorway. "Barney Boy" or is it "Little Brown Jug" about to pull a flat deck B-train up the steep Haywards climb. 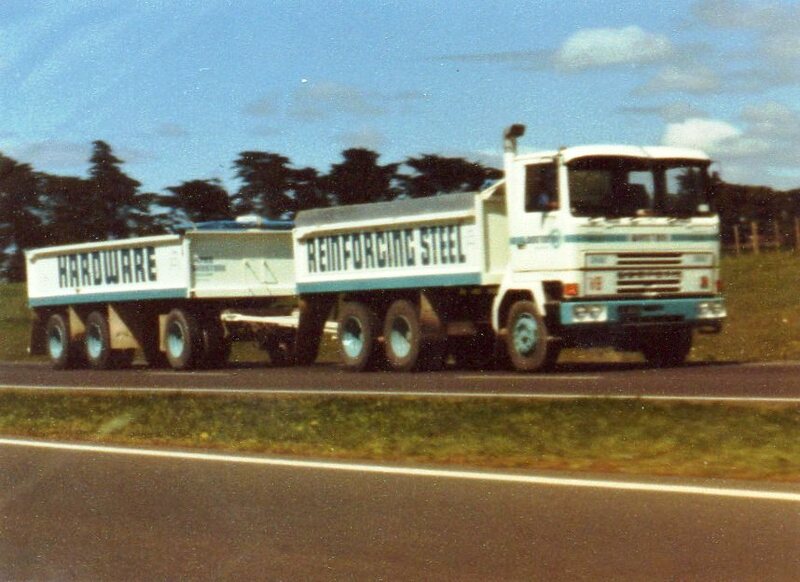 Ohakune Transport's fleet, consisting of Mercedes-Benz, F series Mack, R series Mack, G88 Volvo and 4 wheel drive Leyland. This was the first W900 I had seen with a sleeper box. 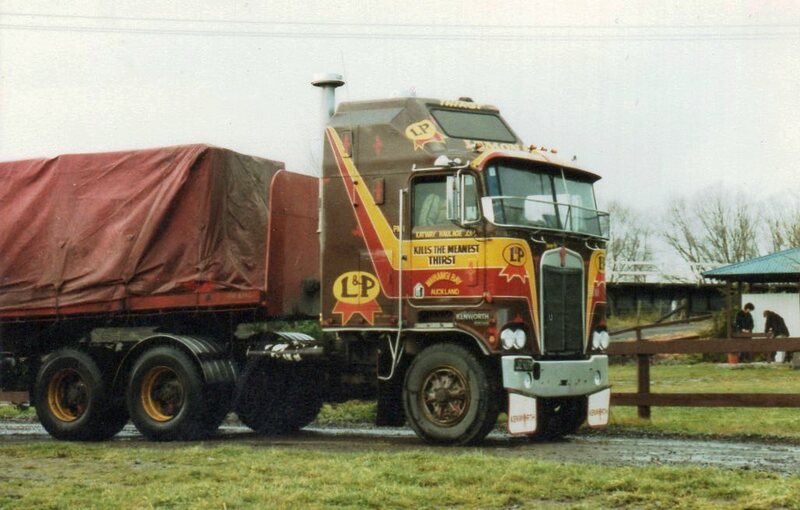 No registration or livery to give any clues as to what fleet it entered. 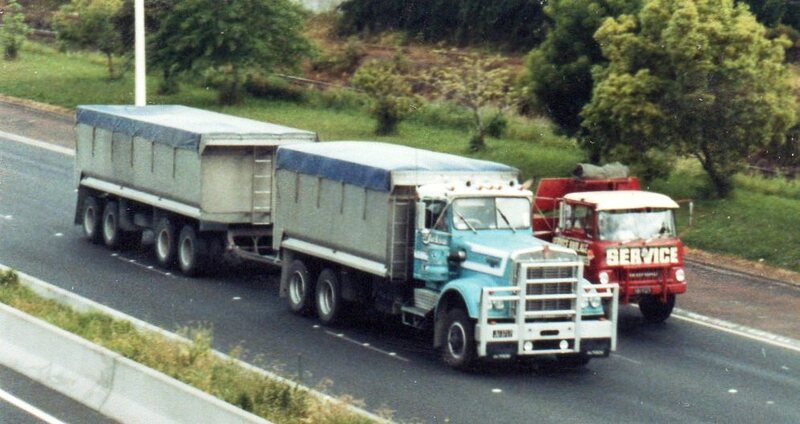 Another W Kenworth being overtaken by a light weight Nissan, with a load of post holes!